Zion Market Research has published a new report titled “Enterprise 2.0 Technologies Market By Platform (Wikis, Blogs, RSS, Mashups, Online Communities, Social Bookmarking, and Social Networking) and By Application (Information Technology (IT), Manufacturing, BFSI, Education, Healthcare, Transport, Government, Retail, and Others): Global Industry Perspective, Comprehensive Analysis, and Forecast, 2017—2024”. 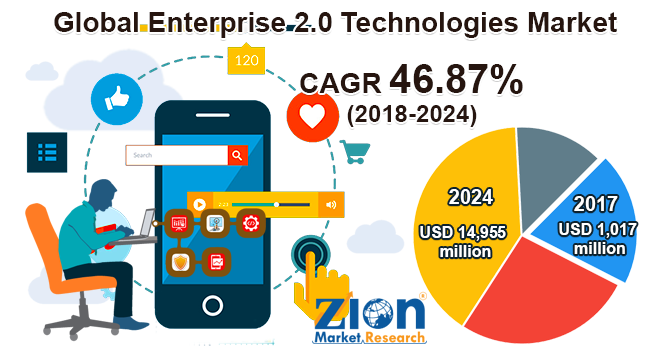 According to the report, global enterprise 2.0 technologies market was valued USD 1,017 million in 2017 and is expected to reach around USD 14,955 million by 2024, at a CAGR approximately 46.87% for the forecast period from 2018 to 2024. Enterprise 2.0 technology can spur productivity, efficiency, and innovation by encouraging staff and other stakeholders to discuss business problems and share information in an open and collaborative setting. According to a survey, 69% of respondents claimed that their organizations have benefitted with better access to knowledge, effective marketing, innovative services, and higher revenue. The survey also found that the companies not only integrate enterprise 2.0 technology but also establish a network that involves the company, suppliers, and customers. The enterprise networking software or enterprise 2.0 technologies market is likely to gain momentum in the upcoming years owing to various business sectors’ shift from on-premises to cloud-based services to improve their business processes. The enterprise 2.0 technologies provide benefits to both internal and external business processes, such as communication and marketing with customers and suppliers, knowledge and innovation management, etc. Moreover, the increasing regional diversity of workplace demands a large number of employees to work from their homes, which is anticipated to contribute notably toward the enterprise 2.0 technologies market in the future. Additionally, enterprise social networking is expected to grow substantially over the forecast period, driven by content analytics. With the aid of analytics, various organizations are able to monitor social interactions based on products or services offered in the enterprise 2.0 technologies market. Numerous social media platforms are rapidly used in across different business sectors for sharing files, documents, information, and for communication purposes. By platform, the market is segmented into wikis, blogs, really simple syndication (RSS), mashups, online communities, social bookmarking, social networking, and others. By application, the market includes information technology (IT), manufacturing, BFSI (Banking, Finance, and Insurance), education, healthcare, transport, government, retail, media, and others. The BFSI sector is anticipated to hold a significant market share in the upcoming years, due to increased preference for online banking. By region, the Asia Pacific region is expected to grow rapidly in the global enterprise 2.0 technologies market, owing to the rising number of installations and investments in research and development of enterprise social networking software in the region. Europe is projected to hold a considerable share of the global enterprise 2.0 technologies market in the future, due to the rising investments and adoption of cloud services. The North American enterprise 2.0 technologies market is likely to contribute a major revenue share in this global market in the future. This can be attributed to the early adoption of cloud technology and increased acceptance of social media by a majority of the U.S.-based companies. The key players of the enterprise 2.0 technologies market include IBM Corporation, Microsoft Corporation, Cisco Systems, Inc., Oracle, and SAP, among others.